I love the power of book clubs in middle school and agree with the conclusion that supporting more authentic structures and routines have created more authentic and rich clubs. I often have my students record their meeting using a school iPad and then share it with me. I’ll watch it back and email them with feedback based on the goals we set before clubs started. In 8th grade this year, I also gave a final “test” using a Google form asking them a few short-answer questions about how this book changed them or their view of the world and how they grew in reading skills during this club work. Happy to share the template they came up with for assessment if you’d like it. If I could teach book clubs all year, I would! Happy to…just shoot me your email and I’ll pass it along…thanks! Emily, sounds like a great idea. I’d love to see what you have. Or if you could post a link here. Emilyrietz, can you share that with me as well? Thanks. Emilyrietz, I just looked through your rubric and really like it. Thanks to you and your students for sharing it! Thank you for sharing this info! 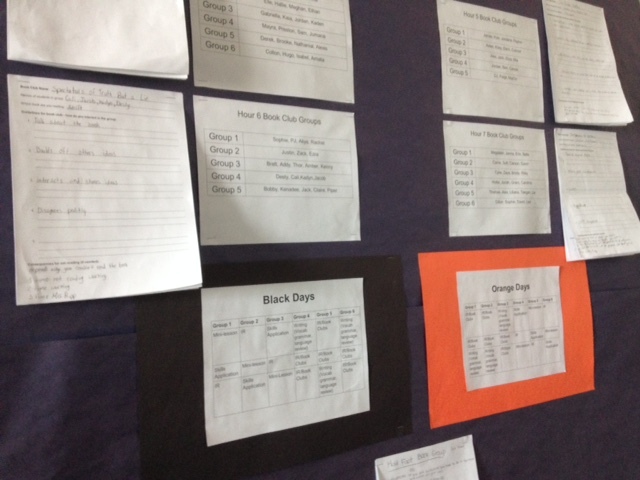 What’s your thought on how students are grouped- by interest or ability? I offer book choices using the Harvey Daniels book pass model, which typically results in self-selected similarly leveled texts and definitely honors interest. In book clubs, I think interest trumps as the group members support/co-construct comprehension so well. I usually try to model that with a tricky short text before we start clubs. Each brain brings so much to a text! Have you checked out Vicki Vinton’s new book on reading process?? I have not but have heard wonderful things. I think it’s a tricky balance and my thinking has changed over the years. I used to group by perceived ability but students knew it and it also stymied the conversations. Now I group more by interest and want to be together. The discussions tend to be more powerful that way. Any chance you could share the requirements for the students’ individual projects they have to complete? Hello, Pernille! Thanks as always for your wonderful posts. I teach 7th grade ELA, and I’m looking to have my students form book clubs. The only snag is that they’re going to be reading different books. Do you have any suggestions on how to use book groups when students are reading different things? My brain is having a hard time visualizing how this would work. If the books are all different, then what is the same? Thanks in advance! I would be asking the kids to look for commonalities within their books, such as do they share conflicts? Character developments? Themes? Also, if you use something like the signposts from Notice and Note then they could also discuss what they are finding as they are going deeper with the text. I would also ask the kids what they want to discuss so that it does not turn into a summary every time. Hi Pernille! I am a Literacy Coach, and I am currently working with a grade 5 teacher and helping her to implement book clubs. The students are really excited about book club, but we’re having an issue with absenteeism (flu season!). I’m just wondering how you handle absenteeism with book clubs? Thanks in advance. Hmm, it depends. Often I have the kids handle it amongst themselves because they have their reading calendar already they know what the expectations are for where they should be. If a child gets wilfully behind we handle it on a case by case basis. Colleagues…I had the chance to talk book clubs with other middle and high school folks recently at a conference…here’s a link to that presentation, which includes book lists. I hope you find this helpful! Thank you for sharing your journey through this. I just moved to teaching 7th grade Pre-AP English from elementary reading specialist and first grade teacher. My foundation is doing this and reading, discussing, etc. Having to incorporate SpringBoard curriculum with district curriculum, and let’s not forget the hard fact that these kids take the state test in writing this year, all in a 47 minute timeframe….I’m learning lots. A few questions I have, how do you incorporate your writing workshop into this? My kids take both reading state test and writing test, but the class is structured more around an English viewpoint than reading. Does that make sense? As a HUGE advocate for Reading and Writing Workshops in all grade levels, I love your insight you share on how to make this work in 7th because that is where I am this year! 🙂 I really want to do more of this book club and would love to see how I can make it work with my curriculum. Thanks for any help! I really want their book clubs to focus more on the discussion, so while they have a short written theme analysis due to me at the end, we do not do a lot of written work during this time. Because my class has to encompass reading and writing within the 45 minutes, we will then go back into writing once we are done with book clubs. We always start with 10 minutes of free independent reading every day so that becomes the reading component when we are more focused on writing lessons. SO we switch between reading and writing workshop as necessary. Hi, Pernille! Our MS is ready to try book clubs. Do you have a list you could share of those 70 or so book choices (which are probably always changing) you’re considering or have done in the past with 7th graders? It would be much appreciated, as we’re building our libraries again – thank you! I run book clubs in a very similar way. One strategy that I have discovered to work phenomenally is to have the students record their discussion so I can listen to it later. It allows them to discuss without me hovering too much and holds them accountable to stay on task when I am out of earshot.